CAMBRIDGE — Anyone who thinks a three-hours-plus, four-actor, minimally staged play about Joan of Arc is not his or her cup of tea needs to think again and get down to Central Square Theater now. Bedlam’s production of George Bernard Shaw’s “Saint Joan,” which Underground Railway Theater presents at the venue through Feb. 8, is riveting, surprisingly funny, and unsurprisingly moving. One of the best-acted shows of the season, it zooms past, relatively speaking. Known as “The Maid of Orléans,” Joan was a 15th-century French teenager who believed herself instructed by God to lead the French armies in driving the English out of France. Despite her victories, she was captured and eventually burned at the stake for heresy. Shaw published his play in 1924, four years after she was canonized by the Catholic Church. Andrus Nichols embodies Joan’s bravery with a raw and unguarded performance, raspy-voiced and without vanity, declaring, “I shall dare, dare and dare again in God’s name!” Nichols leaves both Joan’s glories and her nerve endings exposed. Whatever you believe when it comes to miracles and heavenly voices, you’ll never doubt her conviction. The pre-Reformation Christian Church hovers over every page of the script, but Joan’s story also resonates with the present day. She is reviled by clerics not only for heresy but for wearing men’s clothes, for failing to conform to the church’s image of a proper woman. And the audience’s ears seem to perk up when Mohammed is cited as another threat to the church’s hegemony. Bedlam artistic director Eric Tucker is readying the play for a run presented by Underground Railway Theater at Central Square Theater. The play’s nearly two dozen other roles — earls and archbishops, soldiers, and servants — are performed by three actors. They’re all compelling, even when switching rapidly between characters with consecutive lines of dialogue. A hat comes off or a pair of glasses goes on and a new character appears, in a way more common in farces than heavyweight drama. It works most of the time. Edmund Lewis (Sebastian in the American Repertory Theater’s 2014 production of “The Tempest”) provides comedy with a touch of pathos as the wimpish Dauphin, and growls with equal authority in other roles. Tom O’Keefe plays mostly earnest, angry guys, which makes him more important as the tragedy gathers steam. 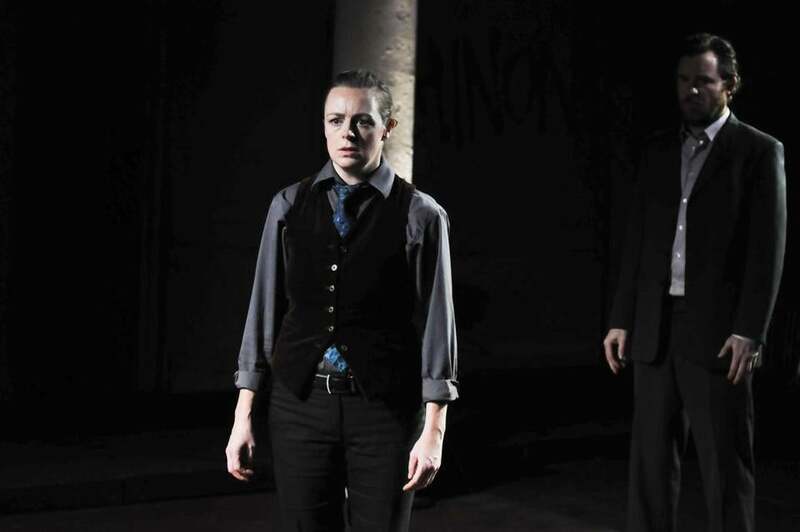 Bedlam has presented this “Saint Joan” in New York and Washington, D.C. Tucker also directs and thus gets the lion’s share of the credit for the production’s aesthetic, with minimal props and costumes. Locations are sometimes written on the wall, scenes lit by the house lights. The fourth wall gets broken almost as a whim; at one point an audience member is even handed a speech to read. 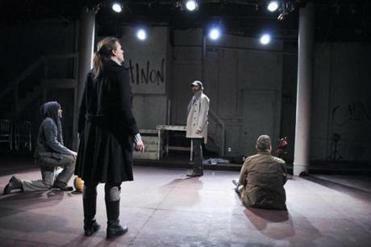 Shaw’s play is divided into six scenes and an epilogue. Bedlam inserts two intermissions, and at each one, parts of the audience are asked to move to accommodate the staging, sometimes bringing their seats with them. It doesn’t always seem quite necessary — turning an entire section to face the opposite direction was an unwieldy process at Sunday’s matinee — but you’ll go along willingly because everything else works so well. Tucker also directed Bridge Repertory Theater’s 2013 production of “The Libertine,” which also had unconventional, open-floor staging and terrific acting. More, please.